For each of these arrangements, we can create five modes, depending on which white dot we choose as the root. An edge with one red dot means there will be two excluded notes between the white endpoints (remember that we dropped one of those excluded notes to simplify the diagram), which means the endpoints will be separated by three semitones or a minor third (m3). 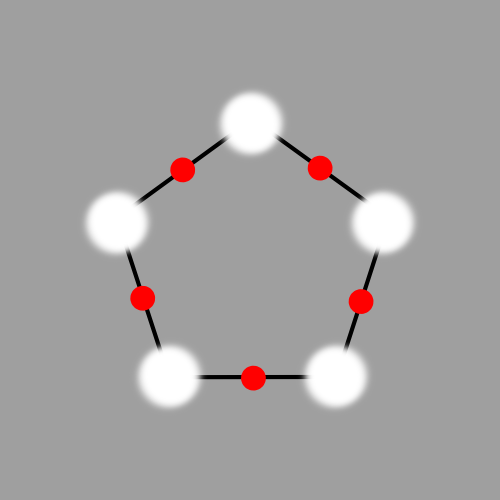 Similarly, an edge with two red dots represents a major third (M3). An edge with no red dots represents a whole tone (M2). Walking around the pentagon clockwise, you can extract the interval pattern for the scale as a sequence of whole tones, minor thirds, and major thirds. Our first template (two red dots together on one edge) represents the interval pattern M2-M2-M3-M2-M2 and generates all of the five-note subsets of the whole-tone scale. This is fascinating material, but not what comes to everyone’s mind they hear the word “pentatonic.” Our second template (red dots on adjacent edges) represents the interval pattern m3-M2-M2-M2-m3 and also creates some uncommon pentatonics, although one of these (1, b3, 4, 5, 6) can be seen as a subset of the Dorian mode of the major scale, or as a subset of the melodic minor scale. The third template (red dots separated by one edge on one side, and two on another) represents the interval pattern M2-M2-m3-M2-m3 and generates the familiar major and minor pentatonics. The diagram below includes all fifteen possibilities. The five modes of each of the three template are arranged around the points of three large pentagons. 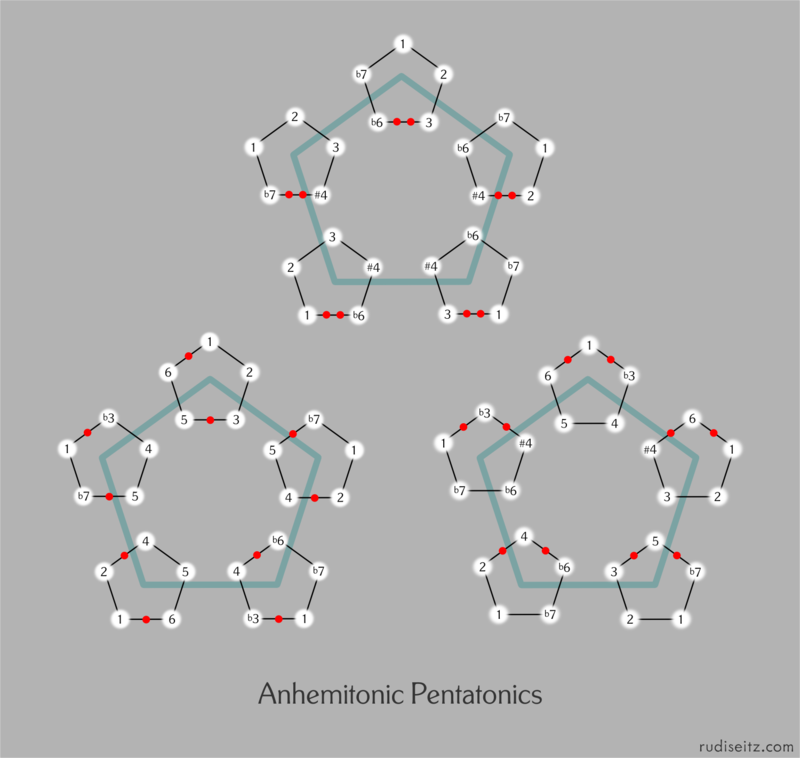 As you move clockwise around one of the large pentagons, you’ll see that the root note in the small pentagon (the white dot labeled 1) shifts around, while the red dots remains in place. The remaining vertices in each small pentagon are labeled as scale degrees relative to the given root.